HON. JUAN C. ASUGAS JR.
HON. MACARIO G. MONTUERTO JR.
Maripipi is a fifth class municipality and an island in the province of Biliran, Philippines. It is the smallest and least populous municipality in the province. According to the 2010 census, it has a population of 6,699 people. Maripipi is politically subdivided into 15 barangays. ^ "Municipalities". Quezon City, Philippines: Department of the Interior and Local Government. Retrieved 29 January 2013. ^ Jump up to:a b "Province: Biliran". PSGC Interactive. Makati City, Philippines: National Statistical Coordination Board. Retrieved 29 January 2013. ^ Jump up to:a b c "Total Population by Province, City, Municipality and Barangay: as of May 1, 2010" (PDF). 2010 Census of Population and Housing. National Statistics Office. Retrieved 29 January 2013. 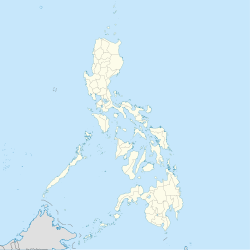 ^ "Province of Leyte". Municipality Population Data. LWUA Research Division. Retrieved 26 August 2013.